Stuffed artichokes are one of the dishes that I make on almost every major occasion since it’s something everyone always asks for and enjoys (including the kids!). It’s tasty and easy to make, not taking more than 10 minutes to prepare and 30 minutes to cook. Artichokes are an incredibly versatile vegetable, and this is just one recipe that I use them (we’ll make others in the future). The artichoke originates in the Mediterranean region and has been cultivated in Sicily for hundreds of years, dating back to pre-Roman times. So it comes as no surprise that it is a staple in every Italian kitchen and certainly is in my Sicilian kitchen. 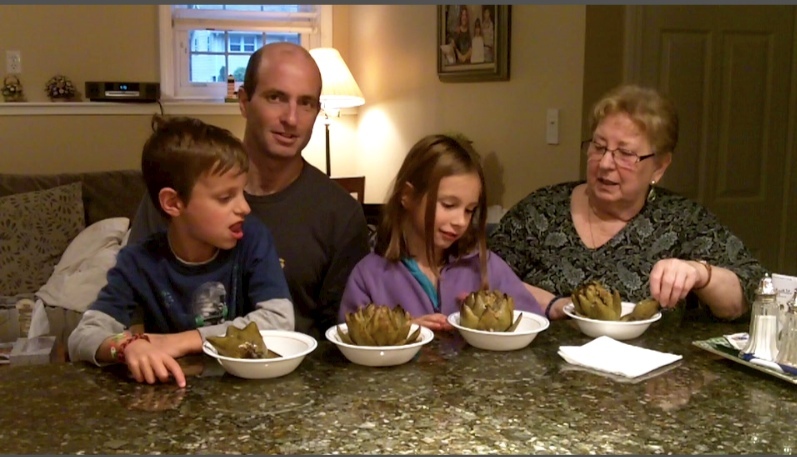 I have great memories of the family sitting around the table, drinking wine (red wine goes great with artichokes), scraping the “meat” off the artichoke leaves and the kids vying over who will get the prized artichoke hearts that the adults elected to give away. Put the seasoned breadcrumbs in a bowl. Drizzle a half a cup of olive oil into the breadcrumbs and mix. The oil should mix thoroughly throughout the breadcrumbs. Clean the artichokes by cutting away any loose leaves. Cut off the stem (you can stuff the stem inside the artichoke if you’d like– it tastes just as good as the hear– or you can throw it away). Wash the artichoke thoroughly. Bang the artichoke against a solid surface, which will help the leaves open up for you to wash them and eventually stuff them. Serve stuffed artichokes hot. Right out the pan is great! 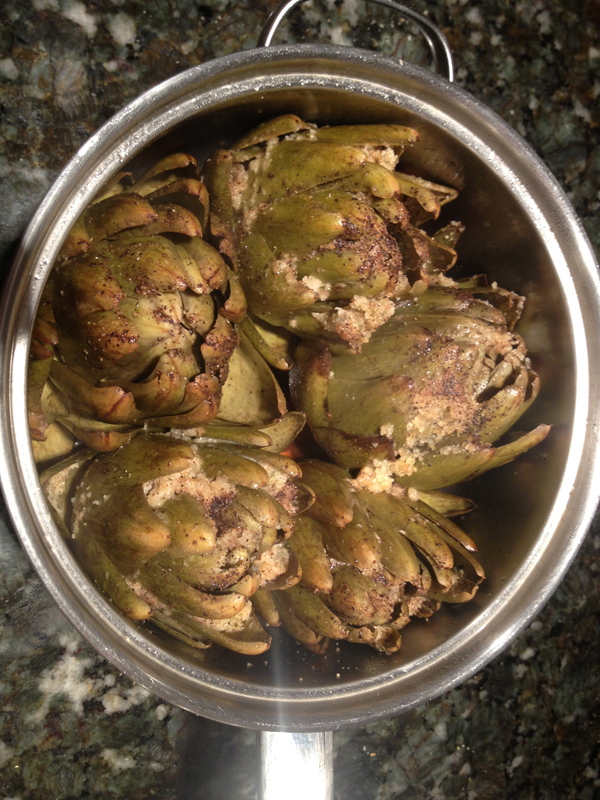 Once washed, dry the artichokes off. 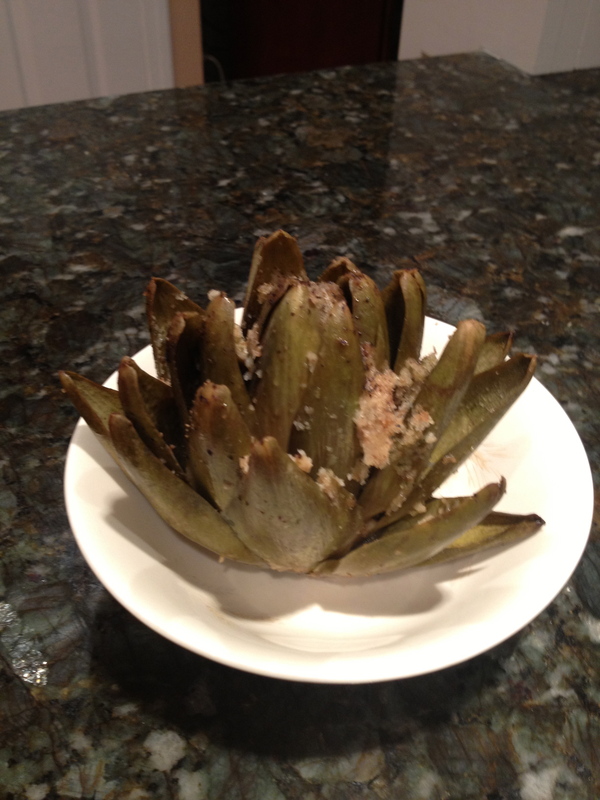 Get a small spoon and start placing the breadcrumbs in between the leaves of the artichoke. You won’t be able to stuff every leave, but you should get good coverage of the the whole artichoke. Once completed, place in a large pan. Repeat with the rest of the artichokes. Once all the artichokes are in pan, drizzle about a cup of olive oil the top of the artichokes. Sprinkle salt and pepper, then add a 1-1.5 cups of water into the pan. Place the pan on high heat on your stove and cover. Stuffed artichokes are great as a side dish or appetizer. Cook the artichokes for about 30 minutes, checking on them every 10 minutes or so. Add more water (1-1.5 cups) to the pan once the other water evaporates. Your goal is to get the leaves and the heart of the artichoke steamed enough so they are soft. You can test how done they are by removing a leaf and tasting it. If the vegetable slides off the leaf easily into your mouth, then it is done. When done, remove from the pan and serve! I hope you develop your own memories and traditions with this recipe. Let me know how it goes! This entry was posted in Appetizers (antipasti), Side Dishes. Bookmark the permalink.